Whether it's a large accounting firm or a small one-CPA shop, all accounting services companies can benefit by using professional services automation software. Designed to provide critical insights into and actionable data about accounting project activities, PSA software streamlines the accounting process and ensures that CPA’s can deliver their work accurately and on time. According to the experts at the Project Management Institute (PMI), every accounting job is a "project" because it is a temporary effort to create a single, specified, unique result. For CPA's, a "unique" project is one focused on client-specified deliverables, such as a tax return, company audit, or balance sheet. And, because those deliverables are unique to each client, every project is one-of-a-kind, relevant only to that client for their particular purpose. The accounting processes developed to complete any one project are almost always different, even if only slightly, from every other accounting project, so each requires an equally unique approach and process from all other projects, as well. Professional Services Automation software offers CPA’s the digital tools they need to streamline and standardize their project accounting activities, even though each project is distinctly different from all the others. Fundamentally, every CPA firm is a business that sells the services of accounting, so mastering its business practices is key to its success. Several PMI studies reveal that adopting a standardized, structured approach to operations and practices was the strongest indicator of corporate success. According to the studies, high-performing companies – those that implemented structured, methodical practices as a normal course of business - were successful at completing their all projects on time and on budget 89 percent of the time, while those companies that were not as diligent in the practices were able to achieve successful completions only 36 percent of the time. Project accounting software allows CPA’s to automate and tailor their accounting activities directly to the project at hand, regardless of its nature, so they are better able to complete it successfully within its term and budget. Financial accounting tracks economic evolution over a period of time, year-over-year, quarterly, or weekly. Project accounting is based on tracking deliverables within a specified endeavor, and is designed to help the CPA stay on task and on time within that endeavor. 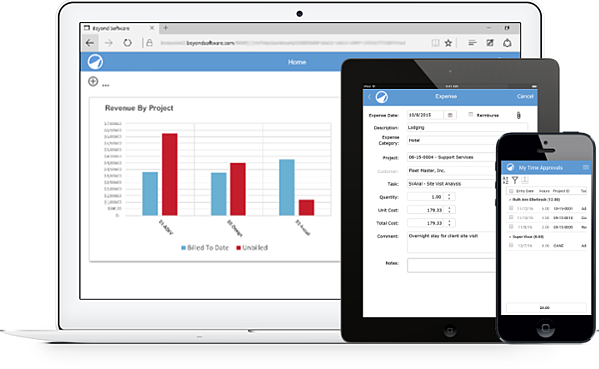 Project accounting tracks tasks and activities, while financial accounting tracks cost centers and departments. Financial accounting is done primarily for the benefit of the stakeholder, usually a business leader who understands basic financial accounting principles. Project accounting, however, is a tool used by the accountant to track and monitor their progress on a specific project, so the accountant is the primary beneficiary of the activity, not the stakeholder. Consequently, software designed for financial accounting doesn’t necessarily apply to project work. Accountants who need dedicated project-based tools to achieve their project accounting goals save valuable time and money when they choose software specifically designed for their purpose. The marketplace is becoming ever-more competitive, and every company, including the CPA firm, must engage all available tools to differentiate themselves from their competition. Professional services automation software designed specifically for CPA’s ensures they can do exactly that. "Beyond's consoles allow us to analyze information from multiple perspectives - by type of service, by resource, by customer, and by date range - which allows our accountants to anticipate our customers' needs for the upcoming busy season."